Hello my fellow nail polish enthusiasts, today I'm sharing with you a mani sometimes referred to as Spun Sugar. It's because you let the polish get tacky and stringy and drape the strings across the nail to give it a textured effect. I also have a review of the OPI Axxium UV gel top coat for you. For the mani I used Sinful Colors Skylark for the base peachy color and Sally Hansen Hard As Nail Purple Craze to do the "strings." I plan on getting a tutorial up soon but I promise a quick google search for Spun Sugar Nail Art pulls up tons of stuff! Now on to the gel top coat! I only sealed my middle finger with Axxium and left the rest textured. 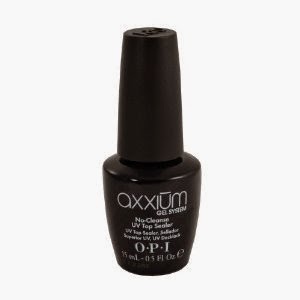 OPI Axxium is a gel top coat that requires curing under a UV light. 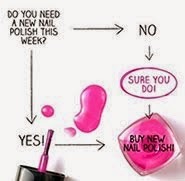 I've read you can use it on top of any polish or nail enhancement (like acrylic or gel nails), you just have to make sure what you are top coating is dry. It did work but got a few "bubbles," I'm guessing due to the purple not being as dry as it should be, that or I brushed a bubble on during application. I plan on using it again over other things soon to get a better feel for it but I'm fairly impressed with the 1st try. 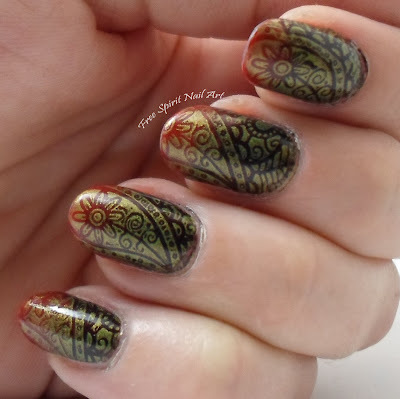 It cured super hard and super fast under the UV light, making it great for nail art! One thing to note is that it did take a 15 min soak with an acetone drenched cotton ball to get the top coat off, as it is a gel nail enhancement, even if it is super easy to apply! I wrapped my fingers in foil to keep the cotton ball in place while it was soaking off. I expected that but was hoping it wouldn't take quite as long. It's definitely great for making a mani last but when I change my polish daily it is just too abrasive considering the removal process. I do think it's a great addition to have in any nail salon or nail tech arsenal and am excited to work with more gels in the future, but more on that later! I hope you liked this mani and let me know if you have any questions in the comments below. As always please share it if you like it!